I chose to attend Daemen because of the amazing opportunities I would have while in the Early Childhood/Special Education program. I’m currently in my fifth semester, and I have had so many amazing experiences with real students, I can’t wait to being my career. I also love how small the campus is, the first time I stepped on campus I felt at home. I have always known that I wanted to work with children, and I feel that many students with special needs are at a disadvantage because they do not always receive the aid that they need. When I become a teacher, I hope to be the person that helps them succeed and encourages them to keep trying. My experience has been both very challenging and very rewarding. I received Top Ten Freshman, and I attribute part of that to the close relationships I was able to build with most of my professors. Daemen promises small class sizes, and Daemen keeps that promise. Because of the way my program is structured, I will have plenty of field experience before I even get to student teaching. There is no doubt in my mind that I will be prepared to begin my career as an early childhood/special educator. Because of how small the classes are, I am able to form close relationships with most of my professors. My education professors have acted as mentors to me over the past few years. I have had nothing but positive experiences with my professors. I have also been able to get to know professors who are not in my department through the Honors Program. Do you live on campus? Please tell us about your on campus experiences. My freshman year I lived in Canavan Hall. I was able to make friends very quickly, and we are still very close. I am living in Canavan Hall for a third year as a Resident Assistant (RA) . I think that living on campus is definitely worth it. I have met so many people on campus, and I have been able to get very close with my friends because of it. In the Honors Program, we are required to complete contracts, which are projects of our choosing for a class that we would like to do it in. I entered the contract I did for my PSY 103 class, and I won first prize. Through the honors program, I was able to attend the National Collegiate Honors Conference in Atlanta, Georgia. I have also been fortunate enough to go into the field and observe and work in classrooms as early as my second semester. I am very involved on campus. 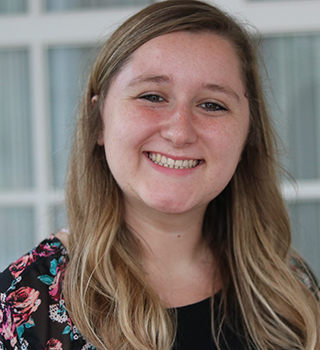 I am a member of the Honors Program,Vice President and Philanthropy Chair for Sigma Omega Chi Sorority, a Resident Assistant, and an Academic Coach. Through this, I have participated in many fun events including the Breast Cancer Walk, Bald for Bucks, Battle of the Brains, Kaely’s Kindness Spring Fling, and much more.